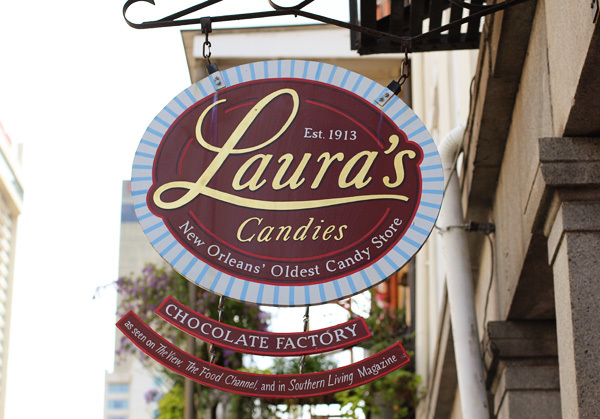 Laura’s Candies, established in 1913, is the oldest candy shop in New Orleans. Located at 331 Chartres Street, it is in the heart of the French Quarter, perhaps the most popular locale in the city for both tourists and locals alike. We offer a variety of traditional New Orleans confections, including our Creole Praline, as well as our best-selling signature item, Mississippi Mud. Also be sure to try our beautiful truffles in a multitude of flavors. Our delicious Creole pralines and chocolates are hand-made fresh daily in our French Quarter kitchen with recipes that date back to the 19th century. We also feature Laura’s Creole and Cajun gourmet items for a taste of authentic New Orleans.